The web has just become… instant! I don’t even have Google Instant turned on… come on people don’t let the web design go beyond usability. Google has put up a cute little site called GiveChrome.com, which can be used to send Google Chrome browser as a Christmas gift to your friends. It definitely a great way for introducing someone new to the Google Chrome browser. Facebook has recently announced that it reached 350 million users. Most users are sharing their real personal information, like birthday, home address, email address, family etc., with their friends only, or simply with everyone. All these important personal information have to be protected some way, and users should have complete control over who can see every little bit of their data. Recently Facebook announced that “new” privacy settings would be implemented soon, and that they would be easier for everyone to understand and configure. Starting from today, my profile has been updated, having the brand new settings. 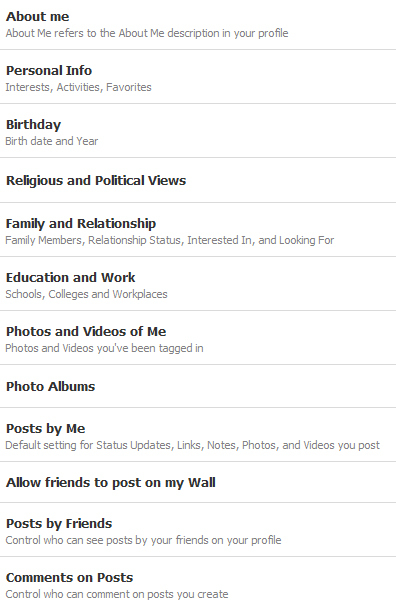 The new privacy settings are certainly looking good. The labels/descriptions are more informative, and they are nicely broken down in five pages (Personal Information, Contact Information, Applications and Websites, Search, Block List). Moreover the options are securely locked, so even if you are logged-in, someone will have to type your password to unlock them and edit something. The status update visibility can also be customized, which is probably the most useful addition. For example you might want to hide from your boss that you are having “fun” while working! 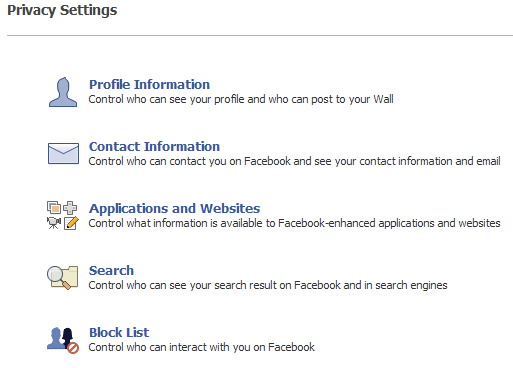 Some of the old privacy settings didn’t make it on the new settings! What I am missing most is the ability to control who can or cannot see your friends, as well as your fan pages. I used to control it with a special friend list, and some exceptions as well. Now this piece of information cannot be controlled, by default everyone will be able to see the whole list of your friends and your fan pages. I also cannot find the settings for individual wall automatic posts/activities. With the aid of the old settings, I could hide some activity updates, like who I became friend with etc. Upon launching the new settings, the user’s profile is allowed to be indexed by Google or other search engines. And that would probably include the name, birthday, friends list etc. I am an existing user, so I can’t check all default privacy settings for a newly registered user. Navigate on your profile page, and click on the little pencil, which is located on your friends block. Uncheck the “Show my friends on my profile” option. If you currently have a look on Twitter or Facebook, many people are concerned about the new privacy settings and are expressing their opinions about certain options which are missing. I hope that Facebook will respond soon, and improve the privacy controls. As a safety measure always remember to preview your profile while changing something on the privacy pages, and possibly ask some of your friends/family what information they are able to view on your profile. Currently Facebook has about 350 million users! And the popular Facebook game FarmVille has about 69 million users! Therefore if you happen to be a Facebook member, who doesn’t get involved with games, you might be getting a little bit annoyed with all those status updates. Moreover, the Facebook News/Live Feed provides valuable information and updates about your friends, so you might need to keep it clean, or simply filter out specific items. – Hover your mouse on top of the item that you would like to hide. – Click on “Hide” that appears on the top-right corner of the item. 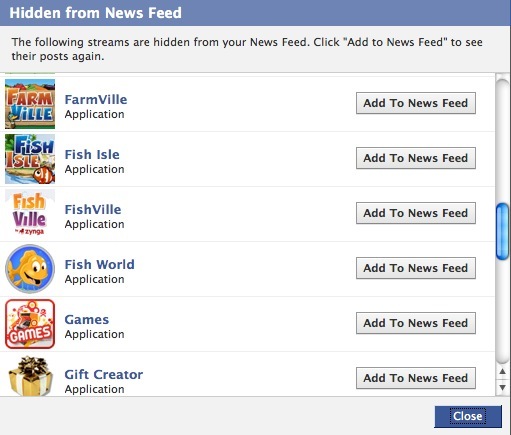 You should now see the message: “Application Name” has been hidden from your News Feed. This is it, you have just blocked all messages coming from the specified application. – Go to your News Feed (it doesn’t work on the Live Feed). – Scroll to the bottom of the page, until you find the “Edit Options” link. – On the popup window, just click on “Add to News Feed” next to the application you wish to unhide. On a side-note, I am a FarmVille player myself, so my friends who are tired of watching the endless FV status updates, should follow this simple guide! Google Image Swirl is an experimental interface from Google for searching images. Image Swirl expands on technologies like “Find Similar Images” and “Picasa Face Recognition” to group similar images together and build hierarchies out of these groups. The interface is showing similar images together in groups/clusters, and you can easily navigate and explore other relevant groups. You can try Image Swirl now at http://image-swirl.googlelabs.com/. Google Fast Flip – read news fast! Google Fast Flip is the latest experiment of Google Labs. 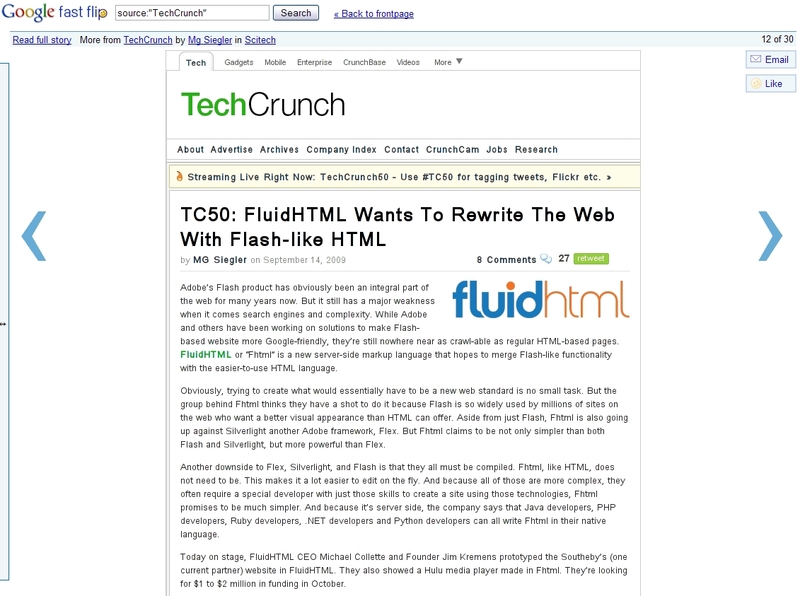 Fast Flip as its name suggests, is a brand new fast way of reading the news online. 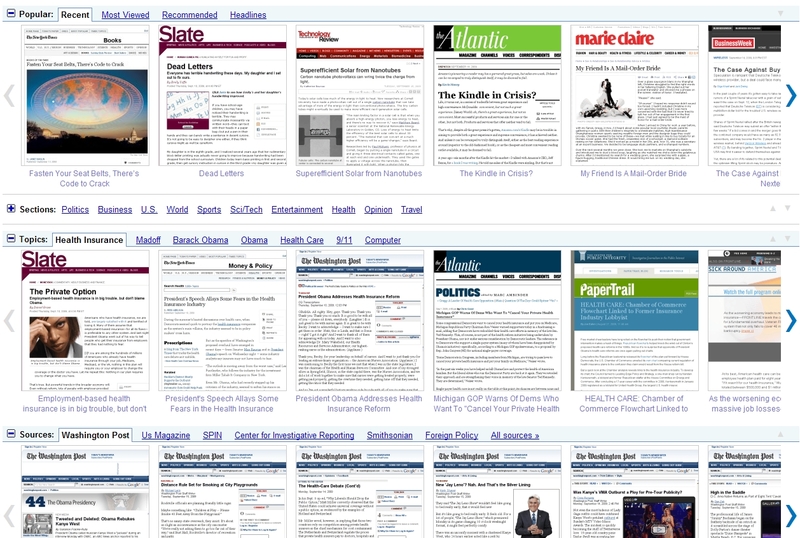 With Fast Flip you can rapidly browse articles sorted by popularity, category or source.